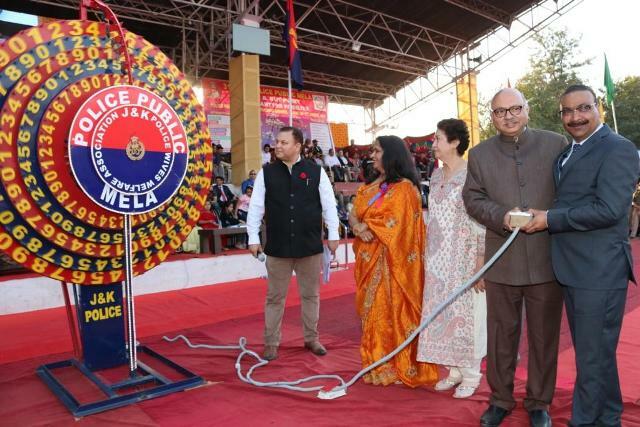 Jammu,March 17 (Scoop News)- The raffle draw of the 31st Police Public Mela organised under the aegis of Police Wives Welfare Association (PWWA), was held at Gulshan Ground here today in presence of huge number of people who cheered joyfully during the draw. This main highlight of the mela, the raffle draw began at 4 p.m in which 7847 prizes were announced which included 21 cars and other high end gifts. Advisor to Hon’ble Governor Shri K. Skandan, Director General of Police, J&K, Shri Dilbag Singh, Mrs. Ninette Vas Sharma, Dr. Rubinder Kaur, Chairperson PWWA a galaxy of police officers and PWWA members was present on the occasion. Speaking on the occasion Advisor Shri K. Skandan appreciated the efforts of J&K Police for organising the Mela in a befitting manner. He said that the event will help to strengthen relations between the police and the people. Director General of Police, J&K, Shri Dilbag Singh, addressing the gathering thanked the people for their huge participation. He thanked the PWWA members, organising committee and different units of J&K police and all the personnel engaged in making excellent arrangements which helped in conducing the event in a smooth and befitting manner. He congratulated the winners and hoped that the people will continue their patronisation in this mega police- public partnership event. DGP said that Police Public Mela provides an opportunity for interaction between police and public. He said that such events strengthen the bonds between police and people which help the force to enhance its capabilities. He said that with the active cooperation of the general public we will be able to ensure peace in the State. He also thanked the media fraternity for covering the event well. DGP thanked Academy for Art Culture & Language, Delhi Public School, Police Public School, Miran Sahib, artists from districts. At the end of the draw Mrs. Ninette Vas Sharma, Dr. Rubinder Kaur Chairperson PWWA and other PWWA members distributed prizes among the best selected stalls of the Mela. The first prize of Rs.12000/- and certificate was given to Police Welfare Center, Jammu, 2nd prize of Rs.10,000/- and certificate was given to Police Welfare Center, Srinagar, third prize of Rs.8000/- was given to Prisons Department. Consolation prizes of Rs.5000/- each were given to PWWA Boutique, Police Welfare Center Kathua, district Anantnag and district Poonch. Prizes for best sale throughout the year were given to Police Welfare Center Kathua and Kulgam. The best worker prizes were given to HC Prabh Dayal and HC Zahoor Ahmed, while best worker from Martyr family was given to Ms Suriya Rasheed dauther of martyr Const. Abdul Rashid. Earlier, in the day Prizes were distributed among the winners of Healthy Baby Competition and painting competition by Chairperson PWWA. The show was organized by PWWA at SDRF 2nd Bn. Gulshan Ground on February 09, 2019 as a part of the mela.